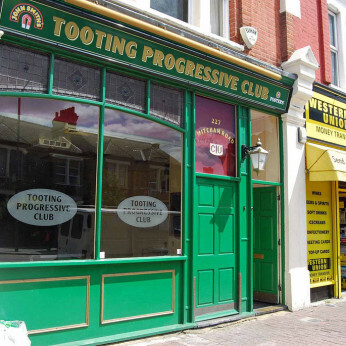 The Tooting Progressive Club is a traditional private members club based in Tooting. We was established in 1904 and have a long established history of providing club facilities to the community in Tooting and surrounding areas. ​Our club is based at Amen Corner, Mitcham Road, Tooting. Our bar is the cheapest in Tooting, and has a wide choice of lagers, ciders, bitters, spirits on offer for guests and their members at great prices. ​Our main bar area has 1HD projector screen plus 6HD large 4K TVs, showing Sky Sports, BT Sports , Racing UK & AT The Races. We also have Dart Boards, Pool Table, Jukebox and poker rooms upstairs. ​The club is available to hire 7 days a week for members and non-members. ​Children are allowed in the club unless otherwise stated. We now accept all major debit cards. **NEW** BAR MENU COMING SOON!! We're really sorry but we don’t seem to have any offers or events for Tooting Progressive. We're sure there must be something happening here but they just haven't told us about it! Please do mention this to Tooting Progressive when you next visit them.